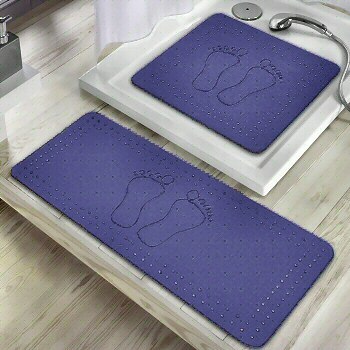 This anti slip, 100% PVC free natural rubber safety tub mat is designed and made in Germany with suction cups and drain holes. Made from a natural elastic material Caoutchouc obtained from the latex sap of trees especially trees of the genera Hevea and Ficus. This is a non vinyl and non chlorine based product. Very comfortable and durable natural rubber construction with drain holes around outside of the design. The design in the center is an imprint of two feet. Very cute! Great non toxic safety mat for kids and adults. PEVA - non vinyl, non chlorine based product eco friendly natural rubber safety mat.